Smartphone manufacturer Alcatel is back at it again; they continue their philosophy of offering great smartphones for a very pocket-friendly price. 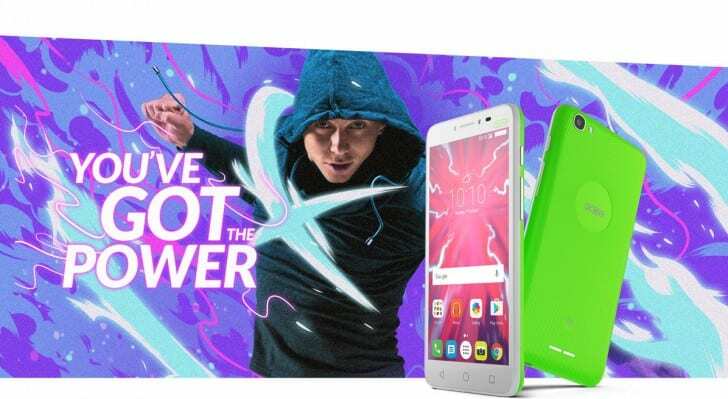 The Alcatel Pixi 4 Plus Power is the company’s latest budget phone, and Alcatel is ready to cement their name and get full attention from mobile consumers. The Alcatel Pixi 4 Plus Power is built of a nice feeling plastic material with a cute net-like design on its back to improve grip. The device houses a 5.5 inch 720 x 1280 pixels (267 PPI pixel density) IPS LCD capacitive touchscreen and carries Alcatel’s signature shapes physical navigation buttons found on all their budget devices. The phone runs a near stock version Android Marshmallow, v6.0 and ships with 1GB of RAM and 8GB internal storage with a microSD card expansion slot. Pixi 4 Plus Power carries dual-SIM slots with dual standby mode and is powered by a processor which is yet to be named with the obvious option being something from MediaTek. The camera on the Pixi 4 Plus Power is a pretty decent 13-megapixel shooter with auto-focus and LED flash and features such as Geo-tagging, touch focus, face detection, panorama, and HDR. The camera can shoot videos in 1080p. Upfront is an impressive 13-megapixel selfie camera also with Led flash. The selling point of the Alcatel Pixi 4 Plus Power is the massive battery it has got. The device carries the “Plus Power” moniker attached to its name and rightfully so due to the presence of a large 5000 mAh battery that should last users up to 2 days worth of battery life on a single charge, given the fact that the device hardly carries any battery hungry specs and even for a flagship device with better specs the battery capacity would be large. The battery supports fast charging so your days of low battery troubles are over. The Pixi 4 Plus Power is globally unlocked to support all 2G and3G network bands and supports Wi-Fi 802.11 b/g/n, Wi-Fi Direct, Hotspot and Bluetooth. Unfortunately, there will be no support for 4G. The device also hosts features such as Accelerometer, gyro, proximity and compass. Alcatel Pixi 4 Plus Power is not a typical device you could use to make guy, but for those of you who don’t do much on your devices but still require a formidable device to get you through your day without the stress of having to juice up every 3 hrs. The device is available in a variety of colours, and there has been news concerning price but expect it to be super cheap and affordable.